My favorite meal of all time is definitely eggplant parmesan. No matter what Italian restaurant I go to, I can’t seem to steer myself away from ordering it! However, frying up a vegetable doesn’t exactly count in the healthy eating department. I still love the taste of eggplant even when it isn’t fried, so I decided to invent a healthy version of my favorite meal. Preheat oven to 375 degrees. If using my Simple, Cheap Tomato Sauce recipe, make this ahead of time and set aside. After peeling and slicing the eggplant into rounds, pre-heat an indoor grill (or use your outdoor grill). Spray each slice with Pam or non-stick spray. Sprinkle the slices with salt, pepper, oregano, basil and garlic powder. Grill the rounds in batches (not overlapping), about 1 1/2 minutes on each side, until tender. Remove from grill. 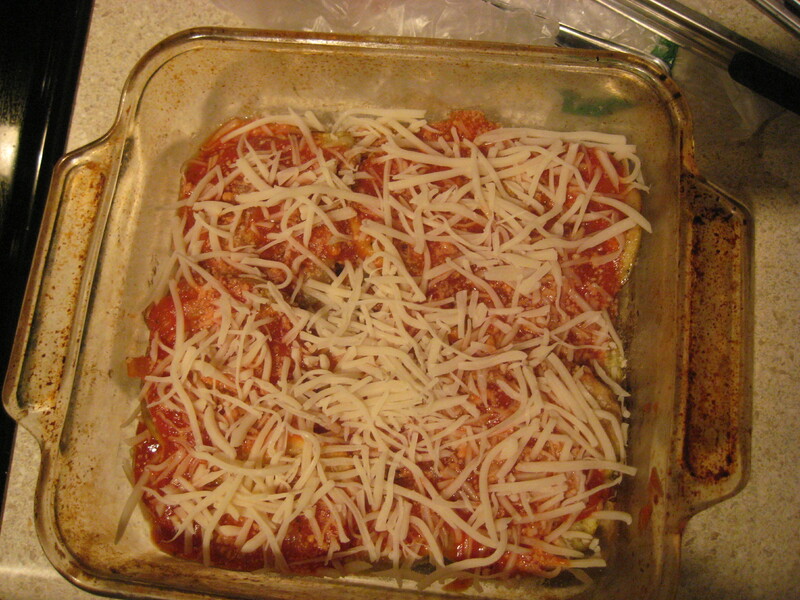 In a baking dish, pour about 1/4 cup of the tomato sauce in the bottom of the pan and spread around evenly. Working in layers, place as many eggplant rounds in the bottom of the pan as you can without overlapping them. 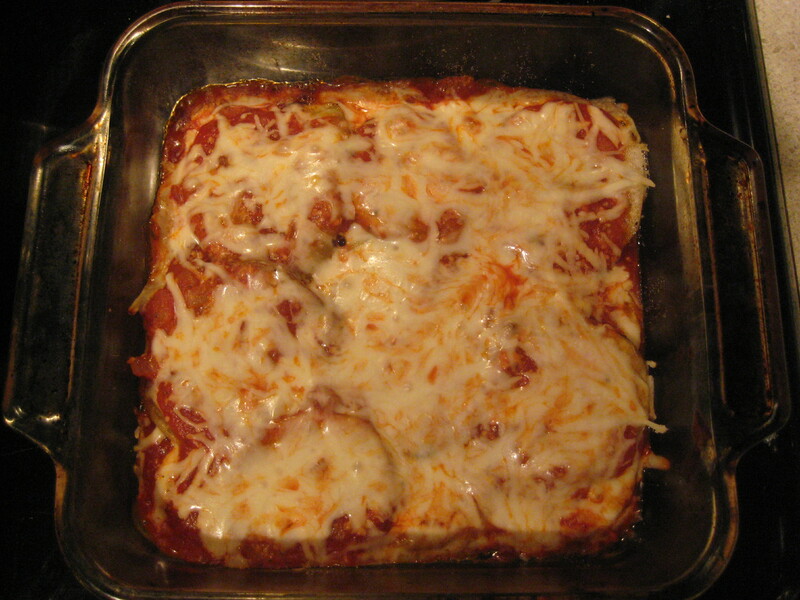 Top with another 1/4 cup of sauce, sprinkle with some of the Parmesan cheese, and then a sprinkle of Mozzarella cheese. Repeat this process in layers until you have used up all your ingredients (should make about 3 layers). Bake for 15-20 minutes, until cheese is melted and bubbly. 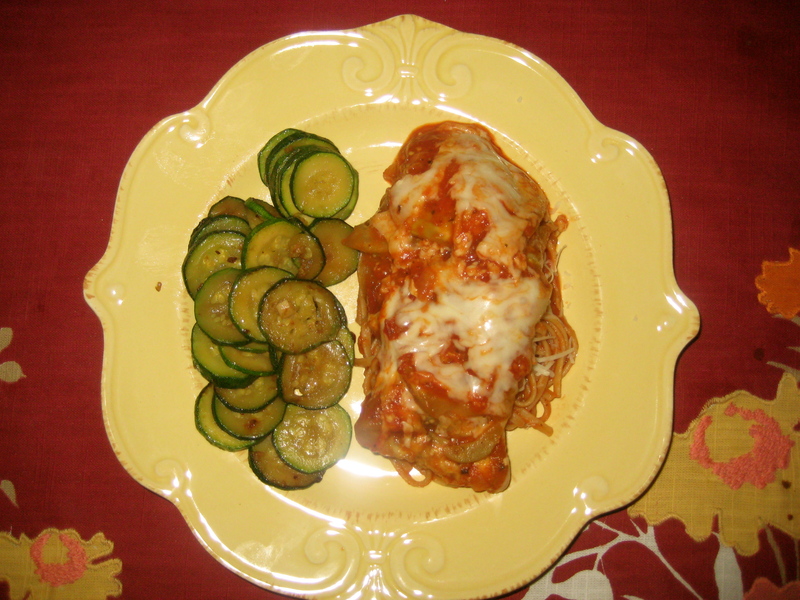 Serve over whole-wheat pasta and a sauteed vegetable on the side.